He needs no description other than “The Greatest.” The legendary boxer Muhammad Ali, formerly known as Cassius Clay, visited the birthplace of his great-grandfather in County Clare in 2010. Thousands turned out in the town of Ennis to greet Ali, whose ancestor Abe Grady — grandfather of Ali’s mother, Odessa Lee Grady — lived on a road called the Turnpike in Ennis before immigrating to the United States in 1860. He married an African-American emancipated slave in Louisville, Kentucky and had a son, John Grady, who became Odessa’s father. Odessa married Cassius Marcellus Clay in 1933. Ali was born Cassius Marcellus Clay Jr., in Louisville in 1942. He began learning to box at the age of 12, and went on to win many amateur titles until his gold-medal Olympic debut in 1960. Throughout his more than 20-year career, the heavyweight champ maintained an outstanding professional record, with 56 wins and 5 losses, three of which took place at the very end of his career. In 1964, he formally announced his allegiance with the Nation of Islam and changed his name shortly after as a way of freeing himself from the a surname he deemed to be a product of his ancestors’ enslavement. Ali suffers from Parkinson’s disease, and the visit to Ireland was part of a nine-day trip to Europe to raise awareness and money to fight Parkinson’s. 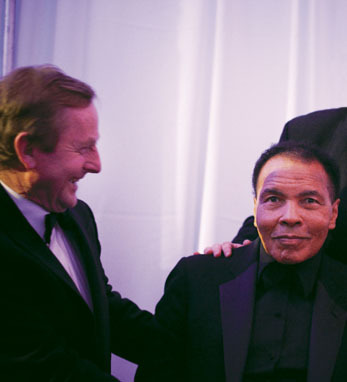 The American Ireland Fund presented its annual Humanitarian Award to the boxing legend at its 36th annual New York dinner gala in May 2011.